For exobiologists, Jupiter's moon Europa remains one of the most intriguing places in the solar system. The moon has an icy shell that overlies a suspected deep-water (subsurface) ocean, and tidal flexing due to Jupiter's immense gravitational tug may provide energy for life. 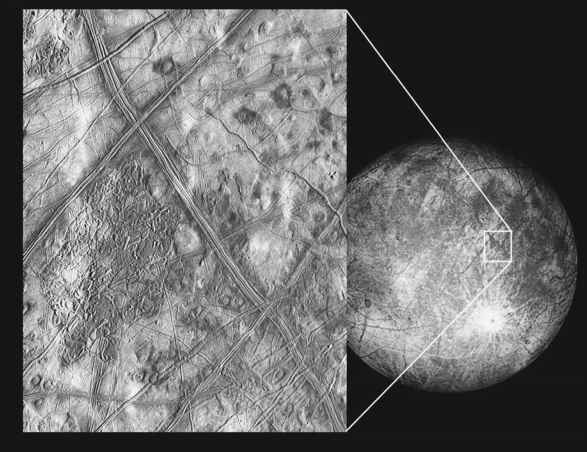 Until the space age, Europa remained little more than a dot of light. 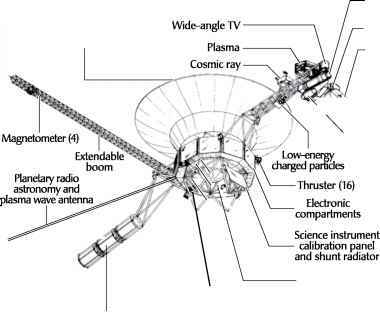 Flyby missions to Jupiter by the Pioneer 10 and 11 spacecraft and the Voyager 1 and 2 spacecraft in the 1970s and early 1980s tweaked a great deal of interest in this mysterious Galilean satellite. 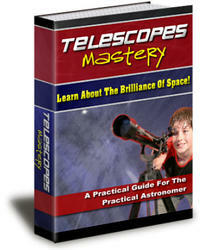 NASA's Galileo spacecraft provided even more tantalizing data. The Galileo mission began on October 18, 1989, when the sophisticated spacecraft was carried into low Earth orbit by the space shuttle Atlantis and then started on its interplanetary journey by means of an inertial upper-stage (IUS) rocket. Relying on gravity-assist flybys to reach Jupiter, the Galileo spacecraft flew past Venus once and Earth twice. As it traveled through interplanetary space beyond Mars on its way to Jupiter, Galileo encountered the asteroids Gaspra (October 1991) and Ida (August 1993). Galileo's flyby of Gaspra on October 29, 1991, provided scientists their first-ever close-up look at a minor planet. On its final approach to Jupiter, Galileo observed the giant planet being bombarded by fragments of comet Shoemaker-Levy 9, which had broken apart. On July 12, 1995, the Galileo mother spacecraft separated from its hitchhiking companion (an atmospheric probe), and the two robot spacecraft flew in formation to their final destination. Europa is the smooth, ice-covered moon of Jupiter, discovered in 1610 by the Italian scientist Galileo Galilei (1564-1642). Flyby visits by robot spacecraft lead scientists to think that this intriguing moon has a liquid-water ocean beneath its frozen surface. Europa has a diameter of 1,942 miles (3,124 km) and a mass of 10.6 x 1022 pounds (4.84 x 1022 kg). The moon is in synchronous orbit around Jupiter at a distance of 416,970 miles (670,900 km). An eccentricity of 0.009, an inclination of 0.47 degree, and a period of 3.551 (Earth) days further characterize the moon's orbit around Jupiter. The acceleration of gravity on the surface of Europa is 4.33 feet per second per second (1.32 m/s), and the icy moon has an average density of 188 pounds per cubic foot (3,020 kg/m3). Next to Mars, exobiologists favor Europa as a leading candidate world within our solar system to possibly harbor some form of alien life. On December 7, 1995, Galileo fired its main engine to enter orbit around Jupiter and gathered data that was transmitted from the atmospheric probe during that small robot's parachute-assisted descent into the Jovian atmosphere. During its two-year prime mission, the Galileo spacecraft performed 10 targeted flybys of Jupiter's major moons. In December 1997, the sophisticated robot spacecraft began an extended scientific mission that featured eight flybys of Jupiter's smooth, ice-covered moon Europa and two flybys of the pizza-colored, volcanic Jovian moon Io. Galileo started a second extended scientific mission in early 2000. This second extended mission included flybys of the Galilean moons Io, Ganymede, and Callisto, plus coordinated observations of Jupiter with the Cassini spacecraft. In December 2000, Cassini flew past the giant planet to receive a much-needed gravity assist, which enabled the large spacecraft to eventually reach Saturn. Galileo conducted its final flyby of a Jovian moon in November 2002, when it zipped past the tiny inner moon Amalthea. 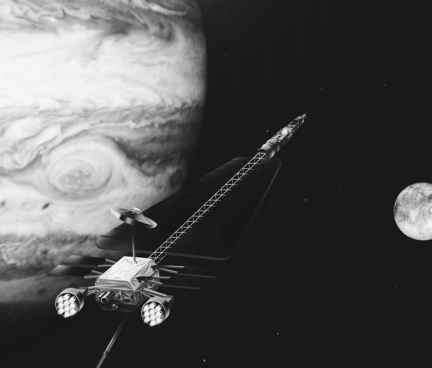 The encounter with Amalthea left Galileo on a course that would lead to an intentional impact into Jupiter in September 2003. NASA mission controllers deliberately crashed the Galileo mother spacecraft into Jupiter at the end of the space robot's very productive scientific mission to avoid any possibility of contaminating Europa with terrestrial microorganisms. As an uncontrolled derelict, the Galileo spacecraft might have eventually crashed into Europa sometime within the next few decades. Many exobi-ologists suspect that Europa has a life-bearing, liquid-water ocean underneath its icy surface. Since the Galileo spacecraft was probably harboring a variety of hitchhiking terrestrial microorganisms, scientists thought it prudent to avoid completely any possibility of contamination of Europa. The easiest way of resolving the potential problem was simply to dispose the retired Galileo spacecraft in the frigid, swirling clouds of Jupiter. So, NASA and JPL mission controllers accomplished this task, while they still maintained sufficient control over Galileo's behavior and trajectory. Close-up study of Europa by NASA's Galileo spacecraft has provided scientists with tantalizing hints that this major moon of Jupiter might possess a liquid-water ocean beneath its icy crust. Where there is liquid water, there is the intriguing possibility that alien life forms (ALFs) may be found. So NASA strategic planners are examining (on a conceptual basis) several future robot missions that would to quite literally "break the ice" in the search for alien life beyond Earth. NASA's proposed Jupiter Icy-Moons Orbiter (JIMO) mission involves an advanced technology robot spacecraft that would orbit three of Jupiter's most intriguing moons—Callisto, Ganymede, and Europa. All three planet-sized moons may have liquid-water oceans beneath their icy surfaces. Following up on the historic discoveries made by the Galileo spacecraft, the JIMO mission would make detailed studies of the composition, geologic history, and potential for sustaining life on each of these three large icy moons. The mission's proposed science goals include: to scout for potential life on the moons; to investigate the origin and evolution of the moons; to explore the radiation environment around each moon; and to determine how frequently each moon is battered by space debris. would allow the planned JIMO spacecraft to orbit three different moons during a single mission. Current spacecraft, like Cassini, have enough onboard propulsive thrust capability (on arrival at a target planet) to orbit that single planet and then use various orbits to fly by any moons or other objects of interest, such as ring systems. In contrast, the JIMO's proposed nuclear electric propulsion system would have the necessary long-term thrust capability to gently maneuver through the Jovian system and allow the spacecraft to orbit each of the three icy moons of interest successfully. Another very interesting conceptual robot space mission to search for life on Europa involves an orbiting mother spacecraft, a cryobot, and a hydrobot. The Europa Orbiter would serve as the robot command post for the entire mission. Once in orbit around Europa, this robot spacecraft would release a lander robot to a special location on the surface, identified as being of great scientific interest to exobiologists and other investigators. After it soft-lands on the ice-covered surface of Europa, the lander deploys a large cryobot probe, which also contains a hydrobot. The cryobot probe melts its way down through the icy crust of Europa until it reaches the suspected subsurface ocean. The cryobot has left a trail of radio transponders behind in the resolidified ice to communicate with the lander, which in turn relays data to the orbiting "mother spacecraft" in burst transmission mode. The mother spacecraft (Europa Orbiter) would keep scientists back on Earth informed of the mission's progress, but this is a totally automated operation without any direct human supervision of the orbiter spacecraft, the cryobot, or the hydrobot. Once the cryobot has penetrated through Europa's thick icy crust and found the currently suspected subsurface ocean, the torpedo-shaped robot probe releases an autonomous, self-propelled underwater robot, called the hydrobot. The hydrobot scoots off and starts to take scientific measurements of its aquatic environment. The robot submarine also diligently investigates the waters of Europa for signs of alien life. Data from the hydrobot are relayed back to Earth via the cryobot, the surface lander, and the orbiting mother spacecraft. The following figure is an artist's rendering of what would be one of the great scientific discoveries of this century. This hypothesized scene shows the hydrobot examining an underwater thermal vent and various alien life-forms (ALFs) in Europa's subsurface ocean. The team of very smart robots (orbiter, lander, cryobot, and hydrobot) in this postulated scenario has allowed their human creators to discover life on another world in the solar system. Whether or not life actually exists on Europa, this type of advanced space exploration mission with a team of future robots exercising collective machine intelligence will be remarkable and will serve as a precursor to sets for even more exciting missions. As discussed in chapter 6, aerospace engineers would have to exercise a great deal of care in preventing the forward contamination of Europa by any future spacecraft that was sent from Earth to investigate this intriguing moon.